Enchantment is now open! 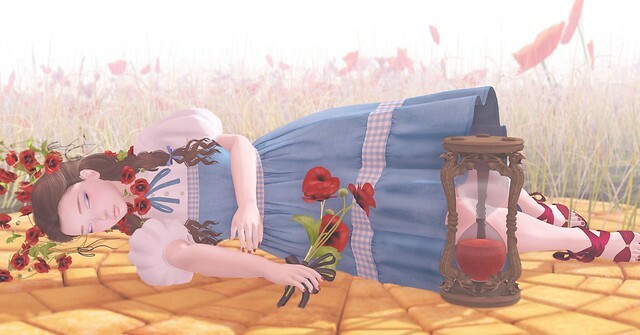 You can head in and pick up so many different Wizard of Oz inspired items, and really, it’s such a great idea. You should do it! I had so much fun with this photo, like, seriously, a ton of fun. NAMINOKE made these stunning poppies that you can wear in different ways, and I immediately knew that I wanted to take a picture like this. The dress I’m wearing, by COCO, and the hair, by Runaway, really brought the idea to life, I think. From there, I added shoes by Luas (in red, of course!) to stand in for ruby slippers, and this completely awesome hourglass by Static. Guys, this hourglass is so cool. It actually counts down, and you can flip it over. In the photo, you can’t tell, but there is a sand animation.